A colleague of mine recently asked me how to secure static content on an IIS server and I thought I would quickly list the steps here for others that are looking for a quick guide on how to do it. 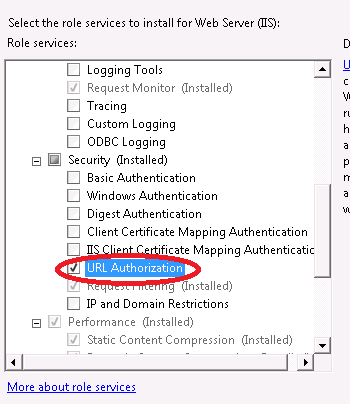 First, the URL Authorization role service should be enabled on the IIS server. To do this, open the Server Manager and go to Roles -> Web Server (IIS) -> Add Role Services and then click the checkbox for URL Authorization. 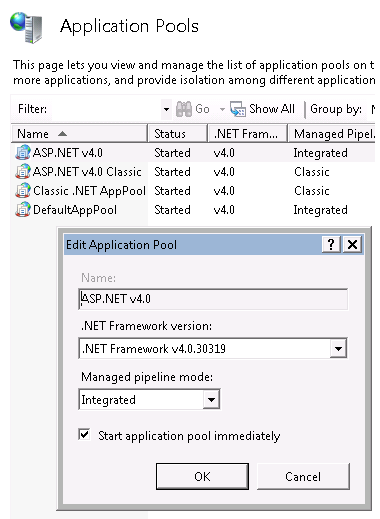 Next, the Manage pipeline mode should be set to Integrated for the Application Pool that the application is running under. You can verify this by opening the IIS Manager and going to the Connections pane. Expand ‘Sites’ and navigate to your web site (or application). In the Actions pane, click Advanced Settings. Then click on the General Section followed by clicking the Application Pool entry.
. . . removed other config . . This should be all that is required for securing your static content with ASP.NET forms authentication. For further reading, I would suggest this page. In a recent application, a requirement was to allow for only a single instance to be running at a time. Typically I would do this with Systems.Diagnostics.Process and search for an instance of my running application, but I wanted to try the Mutex method because it appeared to be simpler and a bit lighter. A Mutex is a synchronization primitive that can be used for interprocess synchronization while most other locking mechanisms are process specific. You can read more about Mutex here</>. It turned out to be much simpler than I had expected, so I thought I would share how to set it up in a Windows Form project. The first step is to add a class with some native methods that are required to bring the application to the top if it is already running. The next step is to define the Mutex that will be used to identify the process. The Mutex.WaitOnce method provides the magic for checking if our process is already running. It has an overload that takes two parameters; Time to wait and a Boolean for exiting the context. WaitOnce returns true if it is able to enter and false if it is not. So, with the following, we can launch the application if it is not already open. And in the else block the existing process can be brought to the top of the display. So there you have it. The application will only allow for one instance and will be brought to the front of the display if a user attempts to launch it while it is running.